← Is Banjul Calling YOU!? Day 4: 100km Done for Peer Health Education in The Gambia! We have finally made it to our first rest day and I think it is more than well deserved for all of us. 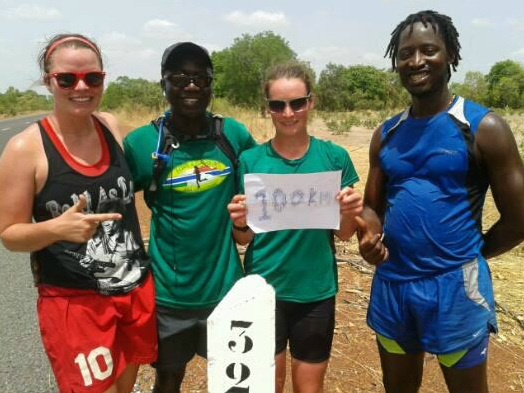 Yesterday we pushed through kilometers 75-100 to make it to the 100km mark, the first big milestone in our run across The Gambia. At the 100km mark! !00km completed all in the name of peer health education in The Gambia! For me, yesterday was one of the first days where I felt like a runner: I enjoyed the challenge of the running and felt like I was able to push myself in a good way. That is not to say that the 25km was easy, because it was not. I just mean that I am starting to feel more like myself again, and this definitely makes the running part a whole lot easier. I think the first three days I was really adjusting to the heat, the food, the accommodations, the lifestyle that comes along with running in Africa. It is entirely different than the lifestyle of Nova Scotia, and I know the adjustment was affecting my running in a big way. When I go for a run in Canada, I usually do it after a good nights rest, on a diet I am used to, and on paths and weather I am expecting. Not the case when you go for a run in The Gambia. These external factors are what really make this cross-country run challenging. However, I think that I am finally adapting to the mileage, heat, culture, food, and so forth, and this really helped me get through the fourth day. So, things are looking up in terms of feeling good while running in the hot hot Gambia! In addition to this, not only did I complete the 25km interval yesterday, but once again I was accompanied for the entire distance with three members of the Love4Gambia team. Kebba/Egweeee! (King) completed the full distance for the second day in a row, and Cielianna and Spider surprised everyone by working together to complete the entire distance (I don’t think either of them had ran much more than 10km at one time in preparation for the run). Quite amazing, what the power of a team and cause can make the human body do! I mention this because I think that the love4gambia run is morphing from an individual run into a team run. Like Erin was talking about in her blog post (foreverinrunningshoes.com), this run is not just about one individual crossing the country because it is so much more than that. • It is about using a sport that almost everyone can do – running – to connect Canadians and Gambians. • It is about inspiring Gambian and Canadian children about the importance of peer health education and health promotion. • It is about raising the profile of the NSGA in both The Gambia and Canada so that its life-saving programs can continue to run in schools throughout The Gambia. • It is about making sure that Gambians and Canadians know how important health education is, so that youth in Canada can appreciate the education they receive to stay healthy and so that Gambian youth can have access to this same information. • It is about, staying healthy and preventing illness, and making sure that youth are empowered to make healthy choices, whether they are born in Canada or The Gambia. All of this with one run – it’s a lot, but it is happening. I am so lucky to be a small part of it and look forward to continuing this challenging journey, for Canadians and Gambians. Love4Gambia has grown so much since Erin initiated it in 2011, and I can only see it growing from here, with increasing interest from both Canadians and Gambians. Who knows, maybe one day this will turn into a relay race with Canadians and Gambians all running together in the name of peer health? The energy and interest is definitely there as I see it right now! But, I am getting way ahead of myself. For now, I must focus on getting my part of the love4gambia 2013 team complete. This rest day has definitely been appreciated (and needed), but I think we are all itching to get back on the road again. 100km done and 324 exciting kilometers to go! BANJUL CALLING!!! 1 Response to Day 4: 100km Done for Peer Health Education in The Gambia! Great post, Jen and what a great list of things that Love4Gambia represents in both The Gambia and Canada!